As I mentioned a few days ago, we have a new blog in town. Hans-Christian Vortisch, author of GURPS Tactical Shooting among many other things, is starting up his own blog. You can see the kinds of things he thinks about in my Firing Squad interview with him. It’s called Shooting Dice – Guns and Gaming. He’s got three posts up already, and a bunch more queued. Go over and take a look. At the moment, he’s writing up some famous fights from movies and other media in GURPS terms – he’s got one from the movie Collateral up now. He’s got a breakdown of the firearms HP Lovecraft owned, and he’s also got a review of the P7M8 pistol, much in the same pathway as I reviewed the Walther PPQ. Given my own interests and writing, you can bet I’ll be reading him. You should too. Let’s just leave him a nice cowboy greeting. Metablog – when do people want GB content to appear? 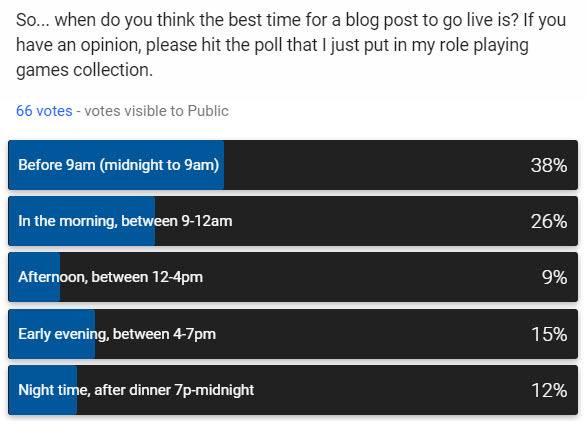 I posed a question on Google+ the other day, asking if a blog is to update content at the same time on any given day, when would readers prefer that content to appear. By a ratio of 66:1, people took the question in the spirit with which it was intended, which was to the good. Here’s the quick results, which haven’t really changed shape as the tallies went from 25-40 votes to over 60. I doubt more will change it that much. The next chunk about 5 in 20 – and this did change hands a bit – is the “before noon” crowd, which probably says “I read blogs during lunch, so get your content up before that. Combined 6 in 20 are afternoon or night-time readers. So really, that 4pm to midnight range is not when people want new content showing up. But only 2 in 20 look for new stuff from lunch to the end of work. They’re busy in the afternoons, whether it be weekend or weekday. So “in the AM” is where it’s at. I’m going to assume that midnight to 2am isn’t really in the running, but I’ll ask a more-specific question about when people sit down to read from about 2am through noon, and see what gives. Thanks for participating so far. The “open” days will either be blank, or if I have an idea that doesn’t fit into another category, I’ll throw it down there. We’ll see if I can keep it going.